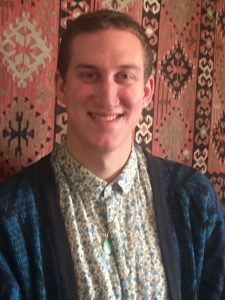 After graduating from college at UCLA with a degree in creative writing and English literature, Jacob Klein moved to the Bay Area in August 2014, hooking onto an internship in Berkeley at Tikkun magazine. They went on to a part-time gig at Laurel Bookstore and a position in San Francisco office of Keshet , a national nonprofit that works for full inclusion of lesbian, gay, bisexual, transgender, and queer Jews in Jewish life. It also serves those who consider themselves queerish and Jewish and seeks to build alliances with friends who do not identify themselves as LGBTQ. They started at Keshet, not expecting the position to last. They stayed three years, and wound up as the organization’s Regional Manager. Among others, Jacob worked with Kehilla members Maya Brodkey and Talya Husbands-Hankin, also known as Lady Synagogue, who recruited Jacob into Glitter Kehilla and introduced them to a simple Shabbat service during the Trans March at Dolores Park in San Francisco in 2015. “I was not raised religiously,” Jacob says. Their family kept Shabbat when they were a very young child. But that went away. “I did not have a B’nai Mitzvah. I don’t have a lot of knowledge about Jewish practice.” That’s changing. Glitter drew Jacob in, both to Judaism and to Kehilla. Along with Glitter, Jacob says, there are now more political avenues, such as with the “If Not Now” movement focused nationally on ending American Jewish institutional support for Israel’s occupation. While the lean of that movement differs from that of Glitter, there is overlap. “They bring in spirituality to their political action. We bring political action into our spirituality,” they say. Meanwhile, Jacob and four other leaders at Glitter — Talya, Maya, Frances Kreimer and Dylan Cox — organize four flagship events during the year along with intergenerational LGBTQ gatherings, commonly attracting about 40 people to each. The last Trans Day of Remembrance brought in about 50, while the “fun, lively and sweet” seders are even more well attended with about 120 attending last spring.